Blue Max is a brand, alongside Professional Woodworker, Speedway, Egergin and Yard Dog, all owned by North American Tool Industries (NATI). NATI has been distributing tools by Blue Max and other similar brands for over 50 years. NATI, as the manufacturer of Blue Max chainsaws, has partnered with Sears, OverStock and Home Depot to provide DIYers with quality power tools. Blue Max saws – manufactured by North American Tool Industries, are hitting the market by storm. Blue Max produce a range of affordable models suitable for homeowners, professionals and those in need of something that’s relatively commercial grade. Ready to take out its competition, Blue Max models feature a range of good specs that see them comparable to leading brands on the market. They are also a distinct blue color which makes them stand out well in displays in comparison to other brands. It has a powerful 45 cc high performance Blue Max engine which is said to have 35 percent higher performance in comparison to other brands. It has a quick start ignition system to make it easier to start. Some users note oil leakage. Many users note issues with the starter cord not retracting. Some components don’t appear to be well made. Blue Max gas powered chainsaw. Dimensions: 12 x 10.24 x 19.29 inches. Bar Length: 14 inches and 20 inches. QWhat fluid ratio do you use? A2,800 RPM without a load. This powerful petrol powered chainsaw is so flexible in its use that anyone can use it – the professional or the homeowner. It features a powerful 45cc 2-stroke engine, easy-start features and it even has safety features which help keep you safe in the field. The automatic oiler will ensure your chain is lubricated at all times, whilst the anti-vibration handle reduces user fatigue. Overall, this is one of the best Blue Max chainsaws for the money, due to the sheer versatility on offer. Check out what other people who purchased this product think about it. Read Blue Max 8901 gas chainsaw reviews. It comes with two sizes of bar and chain for user flexibility. It has rapid reaction safety features for user peace of mind. The chain can come off easily. Users note potential problems with the fuel line. 14 and 18 inch bar and chains. Dimensions: 11.81 x 10.24 x 18.9 inches. Bar Length: 14 inches and 18 inches. QWhat size is the fuel tank? QWhat bar and chain does it come with? ABoth 14 and 18 inches. ASingle Cylinder, 2 stroke, 38cc. 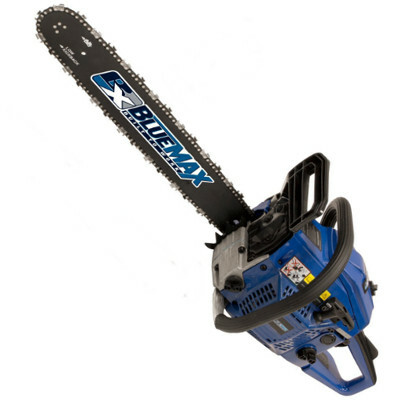 Blue Max is renowned for its versatility and flexibility, and this chainsaw is no different. For the homeowner or the professional in need of something close to commercial grade, this is the saw for you. Check out what other people who purchased this product think about it. Read Blue Max 52721 gas chainsaw reviews. It has a powerful 45 cc single cylinder, 2 stroke engine for work and play. Safety features strongly in this model, with a rapid-reaction kick-back brake. It’s very affordable and replacement parts cost very little. It’s quite lightweight in comparison to other brands, models and manufacturers of similar specs. Once the saw gets hot, it’s hard to start. The auto-oiler sometimes doesn’t function correctly – or let out enough oil. The manual says mix 40:1 but it’s 25:1 – this can have dire consequences. QWhat kind of chain does it need? A0325-inch pitch; 0055-inch gauge; 21 bp chain. This chainsaw does have a few issues which has led to negative reviews. It is known to run too hot and not have sufficient oil on the chain to run efficiently. Aside from those negatives, this saw is a very heavy duty chainsaw suitable for a range of tasks. From small to large and everything in between, no fruit tree is safe from this weapon! It’s not top rated in the market, nor is it the best deal around, but for its price, it’s not a bad chainsaw at all. Check out what other people who purchased this product think about it. Read Blue Max 6595 gas chainsaw reviews. It comes with a lot of accessories. It comes with an additional 20 inch chain. It has a powerful 45 cc single cylinder, 2 stroke engine. In comparison to other models and brands, you get a lot for your money. It’s hard to start when it’s hot. People are experiencing problems with the ignition coil. 14 inch and 20 inch bar and chain. Dimensions: 14.96 x 14.17 x 39.37 inches. QDoes it have a chain brake? 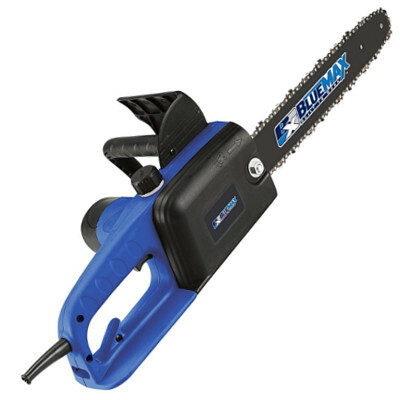 If you’re looking for the best deal on the market, you are sure to find this Blue Max 2.45HP chainsaw fits the bill. For the price, you get a whole lot of accessories, including a premium Blue Max case. It even comes with two chains of 14 inches and 20 inches in size. Some users note problems with some components of the saw as well as it being hard to start, but once it’s going, it goes well! It cuts through tough logs and is suitable for both professionals and homeowners. It’s also packed full of features comparable to most other brands. Check out what other people who purchased this product think about it. Read Blue Max 8902 gas chainsaw reviews. It has a relatively fast motor speed of 3,500 RPM. The chain isn’t very good. It’s known to leak oil. Dimensions: 7.1 x 14.76 x 17.7 inches. QDoes it come with lube? Many users are noting that this Blue Max chainsaw leaks oil, and often doesn’t start at all. Some components also appear to be poorly manufactured, and overall it’s not one of the best Blue Max chainsaws for the money. If you think you’ve got the technical expertise to fix any problems that may arise, then it may be worth the cost. After all, the price tag is very low in comparison to other brands on the market. Check out what other people who purchased this product think about it. Read Blue Max 7953 corded electric chainsaw reviews. It has a reach of 6-10 feet. It has a ¾ inch cutting diameter limit. It has 750 watts of power. It’s limited in its use because of needing to be near a power source. The pole clips aren’t well made and can break. Blue Max pole electric powered chainsaw. Dimensions: 7.87 x 9.84 x 38.19 inches. QHow much power does it have? QCan the chainsaw be removed from the pole? 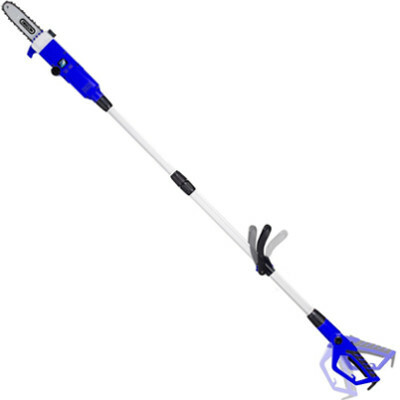 If you need to remove light to medium brush and limbs but don’t require too much power, this Blue Max pole chainsaw might be for you. Run on corded power, this chainsaw can accurately cut through decent sized limbs and hedges. However, due to the saw’s weight, users can suffer fatigue. It’s priced well on the market and replacement parts don’t cost a lot, but this saw does have a long way to go before it reaches the level of other brands of pole saw. Check out what other people who purchased this product think about it. Read Blue Max 52959 electric pole chainsaw reviews. When the time comes to replace the bar on your Blue Max chainsaw, do not hesitate in purchasing a Blue Max replacement guide bar. All Blue Max guide bars stand the test of time, and do so reliably. All bars are heavy duty and rust resistant, and this makes them perfect for being out in all weather. Because of Blue Max self-oiling systems, all bars also have an extended blade life in comparison to some other brands. Blue Max chainsaw bars can be purchased from Home Depot, online, and through Sears. They are very affordable to a wide target market. If you are looking specifically for Blue Max bar, check out this comprehensive guide about available Blue Max chainsaw bars. However, if you’re looking for a bar in general regardless of the brand, you would love to read this full buying guide on how to select the best chainsaw bar for the money including reviews & comparison. If you’ve damaged, broken or worn down your Blue Max chainsaw chain, it’s time to get a new one! Blue Max chains are very good quality and will stand the test of time on your chainsaw. There is more to a Blue Max replacement chain than meets the eye. It’s more than just a standard chain, it has more teeth to reduce cutting time, and it’s long-lasting and easy to clean. They are also very cost effective on the market, and are for sale both online and in stores such as Home Depot or Sears. If you are looking specifically for Blue Max chain, check out this comprehensive guide about available Blue Max chainsaw chains. However, if you’re looking for a chain in general regardless of the brand, you would love to read this full buying guide on how to select the best chainsaw chain for the money including reviews & comparison. Who makes Blue Max chainsaws? Where are Blue Max chainsaws made? Where do you buy Blue Max chainsaws? 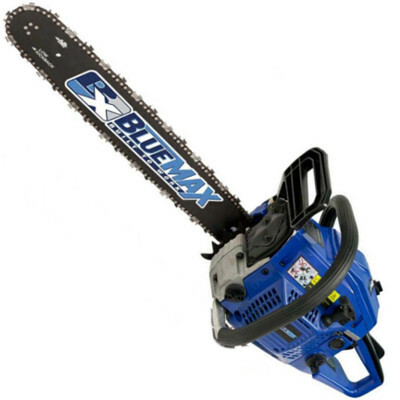 Blue Max chainsaws can be purchased online on websites such as Amazon, and in Sears and Home Depot.